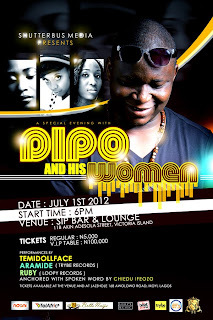 On July 1st 2012, spend a special evening with Afro-Jazz-Soul artist DIPO and his women TEMIDOLLFACE, ARAMIDE (of Trybe Records) and RUBY (of Loopy Records). This promises to be an unforgettable night filled with enchanting music, exquisite company and the perfect ambience to leave you feeling completely fulfilled at the end of the night. Starting at 6pm at SIP BAR & LOUNGE. VI, LAGOS, the performances by DIPO (Be Your Man), TEMIDOLLFACE, ARAMIDE, RUBY and spoken word by CHIEDU IFEOZO are bound to keep you captivated throughout the evening. Be sure you get your tickets and attend this event, a great opportunity to immerse yourself in fine music and company that won't be forgotten for a while.